Last september you could read about the VIE and Create.js implementation in TYPO3 Phoenix. Now roughly a month has passed, and the first alpha release of the product is released. The codename is dropped, and the product is now named TYPO3 Neos. This new content management system from the TYPO3 community has content editing which is fully based on VIE and Create.js. Last months we included multiple libraries from the IKS community, and reworked our content editing module. We now use VIE, Create.js, Hallo editor (also Aloha is included if needed) and we have a rough demo using annotate. Looking back on our early adaptor program we see the semantic capabilities have expanded a lot. As a team we’re really satisfied by this project, and we’re happy we could also contribute in challenging VIE and Create.js. For example when Henri Bergius implemented support for different entity types in content collections. On the TYPO3 conference in Stuttgart Henri Bergius and Rens Admiraal presented decoupled content management and the VIE implementation in TYPO3 Neos. The slides are online already, video recordings are hopefully published soon. Part of our early adaptor program was actually publishing a live demo (use of Chrome or Firefox for testing is encouraged). 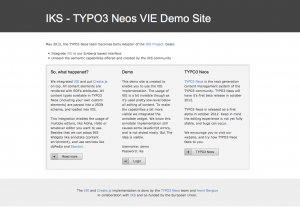 This demo is now available, feel free to check out TYPO3 Neos with VIE, Create.js and Hallo under the hood. Most of the usage of VIE is invisible to the end user. But you can see the result for example when you add a new content element to the page. The content types available are retrieved from the JSON schema loaded with VIE. Every content section is actually an entity collection managed by Create.js. While the editor is still making his changes VIE takes care of the server communication. The content element is created / updated in the personal workspace of the editor, and the ‘Publish page’ button becomes active. All of this is done using Emberjs databindings and event listeners on VIE. Using VIE and Create.js enables us to use more products from the IKS community, like Annotate and Stanbol. As a proof of concept we integrated Annotate in the demo. Some quick tuning on Annotate has been done, and saving / selecting resources is still throwing some errors. But the general idea that widgets can be implemented can be seen. If you want to see Annotate in action you can login to Neos and open one of the content pages. 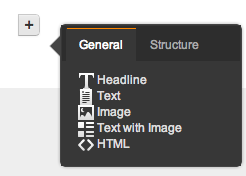 The Hallo editor toolbar has the Annotate button enabled, and after clicking this icon the suggestions are shown. The selecting and saving does not yet work. The homepage gives information about how to log in to the backend. We invite you to have a look at another implementation of VIE and Create.js in a leading CMS.